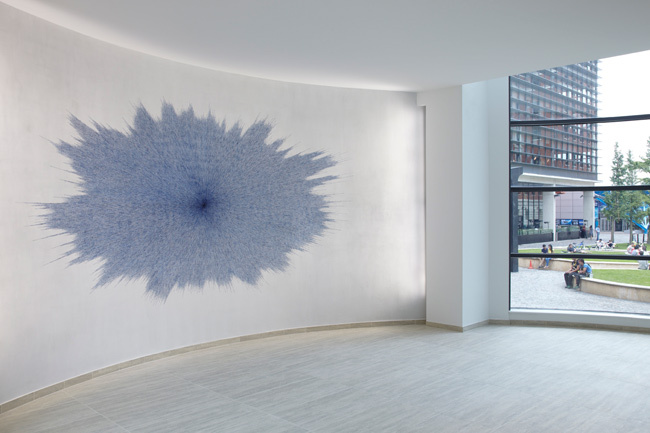 Birmingham-born Idris Khan OBE (b.1978) is internationally recognised for his signature style of layering images and text. In his work he explores the links between classical music, art history, literature, philosophy and religion. He blurs the boundaries between source materials as diverse as Schubert’s symphonies, Milton’s poetry and the Qur’an. Working across media, from abstract paintings to installations and photography, much of his work references memory, including his recollections of growing up in a multi-cultural family in industrial Walsall. Although Idris Khan now lives and works in London, his creative career began in the Black Country. He was born in Birmingham in 1978 and moved to Walsall with his family that same year. His mother was a nurse from Wales, and his father a Muslim who came to the UK from Pakistan. He attended Park Hall and Barr Beacon Schools before studying on the Art Foundation Course at Walsall College. He went on to study Photography at the University of Derby (BA) and attended the Royal College of Art for his MA. “It was when a lot of Muslims were moving to the area, there was a real influx. My father was very liberal, but he did want us to practice Islam. I never really knew what I was saying in those prayers, I was just reciting them. There was part of me that was always lost in language, trying to understand both cultures. I always felt awkward in the mosque. Instead of being the only Asian kid in school, you’d be the only white kid in the mosque” – Idris Khan. A liberal Muslim, Khan’s father encouraged him to attend local mosques, where he remembers the ritualistic, repetitive approach to prayer. His father also taught him to read the Qur’an. In fact, during his MA degree show at the Royal College of Art it was his father who suggested that he photograph every page of the religious text. “This was my dad’s idea. During my degree show, I was photographing every page of a book and using the shots to make a generic image. It was a very repetitive process. I was using Roland Barthes and Susan Sontag books – things that had influenced me. 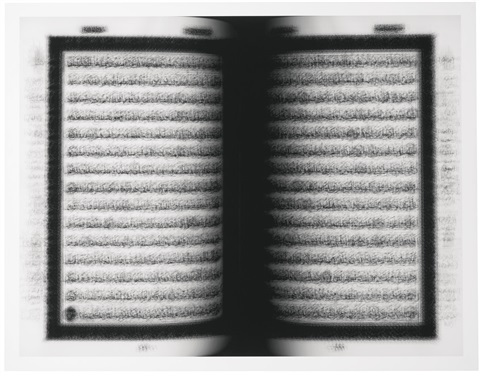 My dad said: “Why don’t you make an image out of the Qur’an?” And I thought, yes, you’ve got to look at the book that has influenced you for your whole life” – Idris Khan. Khan’s reputation rapidly rose to prominence with Holy Qur’an (2004). Built up of many layers, this powerful, poetic work took two months to make. It is a testament to the devotion of those who read and speak the Quran, committing parts to memory. It reveals the acts of contemplation and reflection across time, celebrating spirituality and faith. Another central theme to Khan’s practice is memory. By employing continual processes of creation and erasure, adding layers upon layers, he explore ideas around time and memories. One of his early works White Court (2001) was recently included in a major solo exhibition – A World Within at New Art Gallery Walsall (2017). Using a 5×4 plate camera, he photographed a squash court wall, taken at his former primary school in Walsall, where his mother used to play. He focuses on the marks made by the impact of rackets and squash balls. 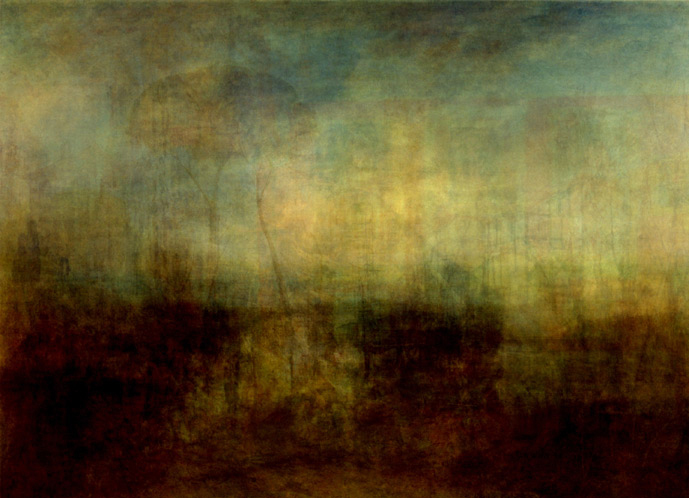 The image demonstrates Khan’s fascination with photography’s relationship to painting, asking the viewer to question whether they are looking at an abstract painting or pictured reality. It also brings in questions of originality and artistic authorship. The relationship between photography and time, and the recollective power of the image has continued throughout his practice in his use of layered imagery reflecting cumulative experiences. For example, he creates texturally rich composite prints built from a series of images, both appropriated and original—such as Beethoven’s complete sheet music, Bernd and Hilla Becher photographs, or William Turner postcards from Tate Britain. These are then digitally layered and altered by the artist. Khan was recently commissioned by Deutsche Bank to create a large-scale wall piece for their Birmingham headquarters at 5 Brindley Place. A River Runs Happy (2014) looks like an abstracted blue cloud, exploding outwards. On closer inspection, the shimmering form is assembled from thousands of short printed words, phrases and sentences on the theme of happiness. It includes the artist’s own words, along with those of others, such as painter Agnes Martin. In order to gain a clearer understanding of the abstract term “happiness,” Khan collected a wide variety of statements on the theme, which overlap in the work as countless rays. In all its multilayeredness, A River Runs Happy shows one thing in particular—that happiness is not a static feeling, and can only be defined in a very personal way. 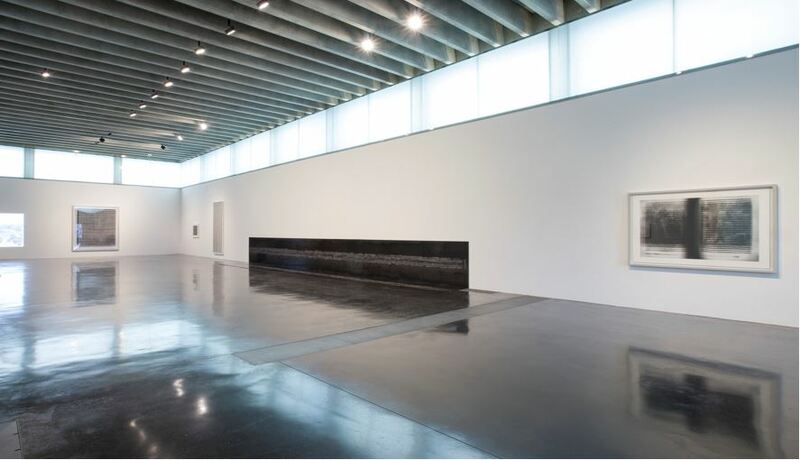 Idris Khan is represented by Victoria Miro, London, Galerie Thomas Schulte, Berlin, Sean Kelly, New York and Fraenkel Gallery, San Francisco. He has works in major museums and collections across the globe, including: The British Museum, Centre Pompidou, National Gallery of Art in Washington, DC Philadelphia Museum of Art, Saatchi Gallery, and San Francisco Museum of Modern Art. Let’s hope he has an exhibition in the Midlands again soon. Ikon?